* Discover how and why your seeds grow. Children love growing seeds. The wonder and learning are a pleasure to watch. Amid the turmoil of life germinating seeds are a cause for hope. And caring for seedlings gives us all a sense of motherhood. More seriously though, success in growing from seed can make a big difference to household budgets. So it's definitely worth learning how to get results. This page outlines the basic needs of seeds - and if you are still growing up - it may help with your homework too. Practical methods for growing seeds in your garden and at home can be found from this link. And there are more links to easy-to-grow seeds below. Larger seeds are easier for beginners to handle, but they don't store for so long. The ovary of a flower contains the seeds in a protective covering. This whole structure is called a fruit. It helps disperse the seeds contained inside. Dry fruit such as pods split open to disperse seeds, while succulent fruit are eaten before seed dispersal. Seeds contain a new plant embryo that's in a dry dormant state. This enables seeds to survive harsher conditions of drought or cold. 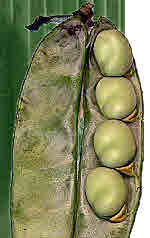 Some seeds also contain a food reserve. Large seeds e.g. beans, sweet corn, and sunflower... contain a big food reserve of starch or oil. But tiny seeds may contain no food reserve at all. thick walled seeds may need to be scarified to break through the seed coat. A wide range of easy to grow seeds can be found on this link. Pre-germination ensures that the seeds don't germinate in nature before the harsh conditions of the dormant season have passed. Your seeds may have either been pre-treated by seedsmen or they may require pre-treatment before germinating. You can avoid problems of pre-germination with easy to grow seed ranges. Seeds germinate when the plant embryo begins to grow. But for germination to happen the seeds require sufficient moisture, warmth, and air. Here's one simple method that you can use to test the viability of your old seeds before expending effort on trying to grow them. Simply place damp absorbent kitchen paper onto a saucer, sow a few seeds, and place in a polythene bag with plenty of air and sufficient warmth. You'll be able to see your seeds germinating. Then you might grow these on by placing the tissue paper on the surface of your potting soil and carefully covering with some compost. But this method is merely a classroom demonstration. I'm holding the seed leaves. 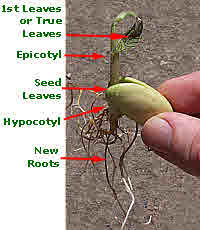 They normally remain below ground while the stalk above them (the epicotyl) carries the true leaves up into the light. 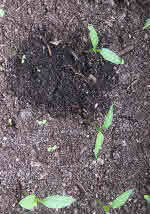 <<Left a cucumber seedling shows seed leaves that look very different from true leaves. 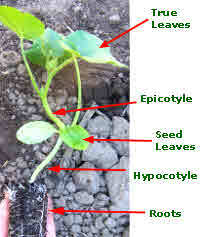 Here the stalk below the seed leaves (the hypocotyl) has elongated so as to carry the seed leaves above ground. It's very useful to be able to distinguish a seedling from a weedling by the shape of seed leaves. Providing the correct conditions of Moisture, Warmth and Air is critical for success with growing seeds. And it largely depends on consistency of the compost or soil that you are sowing on. 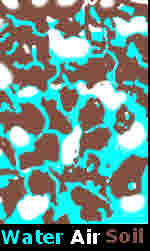 Your soil consists of particles of matter with spaces in between. The tiniest of spaces fill up with water because of capillary attraction. Medium sized spaces may be only half-filled with water, while large spaces contain air. Getting the right mix of air and water is key to success both in pots and garden soil. When pots or trays are stood in water, the soil should become thoroughly moist. Then excess water should drain away freely leaving just the right mix of air spaces and water spaces. Use a fine textured, free draining, moisture holding compost. In the garden you need to work the soil to achieve this consistency. Previously added organic matter helps. Before sowing your seed in a tray, tap down and gently firm soil or compost to create an even texture. This provides for a more even and consistent germination. You may finish off by gently firming the surface again. Your seeds should be in intimate contact with the soil. After draining, your seed compost should naturally hold a mix of both air and water. Some small seeds benefit from light and they should either be covered thinly or not at all. 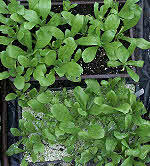 These include:- Lettuce, Lobelia, and Petunias for example. With little or no food reserve, tiny seeds need to germinate close to the soil surface to use the light for energy. So light may be a stimulus for some seeds to grow properly. The tiniest of growing seeds simply can't push through a covering layer. But when grown in trays they benefit from a perspex cover. between late summer and late fall. 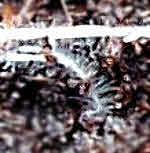 The cold and wet combine to cause the 'damping off' fungus that kills seedlings. At these times resist the temptation to water the compost. But when the warmer conditions arrive dry compost and wilting is the main danger. In cold conditions you can sow hardy annual or perennial seeds onto moist but free drained compost and cover with either grit or vermiculite. Once over with the fine spray watering-can or mist should be sufficient. Heavy watering may displace seeds. Then place in a shady spot where they may be left to germinate without further water. When the season becomes warmer, thoroughly soak trays or pots of compost by placing them in a shallow water bath. Leave to drain a few minutes. 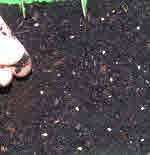 Then sow seed and, depending on seed size, cover with fine grit, vermiculite or dry compost. Moisture is best maintained in seed trays by bottom watering until the leaves appear. Then regular fine sprays or misting may be added. Take a look at my page on Starting Seeds. You'll find methods with propagators, trays and modules that help you better control conditions. These successful methods for growing seeds are especially useful for an early start and to protect your plants. 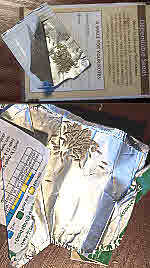 Seed Mats and Seed Tapes provide a nice innovation for seed sowers. You can get themed gardens and grow seeds more easily on slopes. Check seed mats here. Easy To Grow Seeds And Organic Seeds Are Here. Easy Seeds For Kids are here. Seed Mats and Tapes are here. Grow The World In Your Garden with Eden Project Seeds on this link. On this link I found a beautiful selection of organic and heirloom vegetable, flower and herb seeds. Find the Children's Garden Collection on this link. Pre-seeded mats and seed tapes are available here. Growing with children - lots of advice to help with growing children. 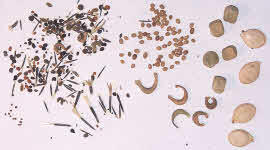 Science Project - try an experiment with seeds & learn more - above, find my links to seed for children.